Collection of Unknown Samples I decided to test paved areas showing residues from cars. I did that in areas near a coastal town of Boquerón, PR. 4 samples were collected, one of them a blank from pavement that did not show traces of oil. See Map. I used Q-tips and a small amount of mineral oil (MO) for human consumption (no additives on the label). I added ca. 1mL of the MO to the residues on the pavement and recovered as much as possible of it swabbing the Q-tip and squeezing the cotton on the inner surface of the vial. Different levels of color were recovered and basically none in the pavement blank. Mineral oil was added to all samples to achieve a similar volume. SINCE FLUOROMETRY IS VERY SENSITIVE TO TURBIDITY AND PARTICLES, I WILL WAIT FOR A FEW DAYS BEFORE ANALYSIS. IF IT DOES NOT WORK, THEN SOME SORT OF SIMPLE FILTRATION/CENTRIFUGACION METHODS MIGHT BE NEEDED. THE ADDITION OF DEHYDRATING SALTS TO REMOVE WATER FROM SOLUTION AND DECREASE TURBIDITY. This is so great! I'm curious, are you able to take a motor oil source that's known, and dry it out and prepare it in a similar way, after some aging or weathering? Also perhaps it'd be good to test asphalt alone! No I have not aged any of the standards sent, but is a great idea. 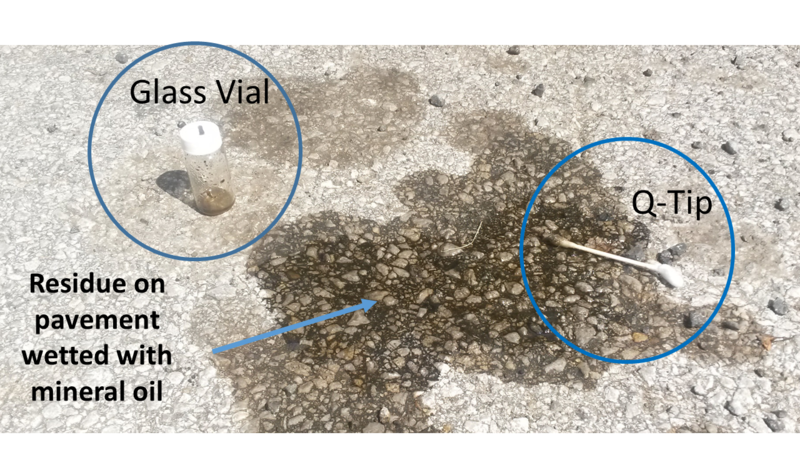 In terms of the asphalt, samples 4, the pavement blank, is asphalt a few meters away from sample 3 (asphalt plus oil stain). It would be worth to test a series of asphalts, new or old. Unfortunately, not. I was trying to hide from work but couldn't. I intend to work on the alignment issues and standards tomorrow. Thanks. I am leaving on a work trip and coud not make the measurements. Only did the dilutions for the unknowns and the standards. When I com back I will troubleshoot final adjustments and conduct measurements. Hopefully 1 or 2 days of work. I have seen some of your posts in terms of adjustments of the instruments. Ill keep them in mind. Got back and made most of measurements. I will be simmarizing results soon.